In this tutorial, we are going to show you the Nokia 105 RM-1134 Sim Card Ways Sim Card not accept or insert sim card problem .” This type of error occurs on any keypad feature phone but mostly this type of error occurs on Nokia mobiles. see below diagram of Nokia 105 sim card problem check which tracks line is damaged and repair Nokia 105 RM-1134 Insert Sim Card Problem. 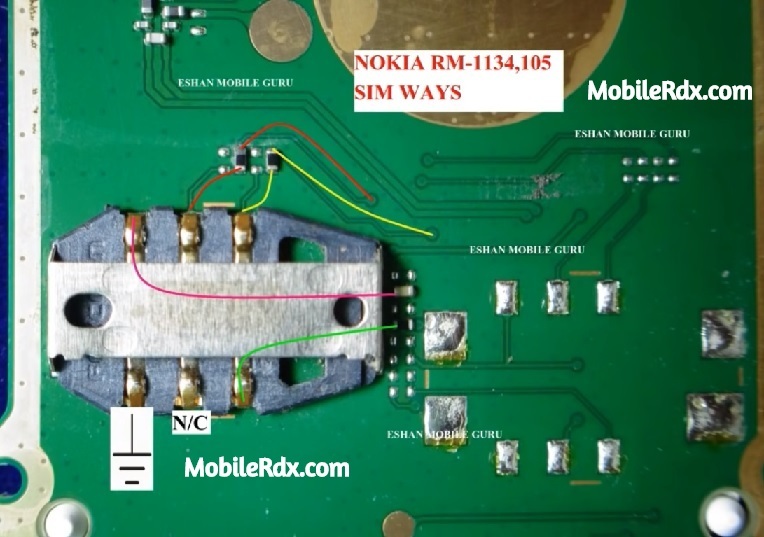 Here’s the full solution for Nokia 105 RM-1134 Sim Card Ways Repair Solution SIM card problem that it does not accept or detect any SIM card being inserted to it. This solution shows the full line paths or connection tracks of the Samsung SIM circuit, from th SIM pin connector through to the SIM filter IC and to the innermost part of the main chips solder ball bumps.